Many of us have trouble sleeping in an unfamiliar place, like a hotel, or a friend’s house for the first time. When we finally do get to sleep, it’s often fidgety and disturbed. 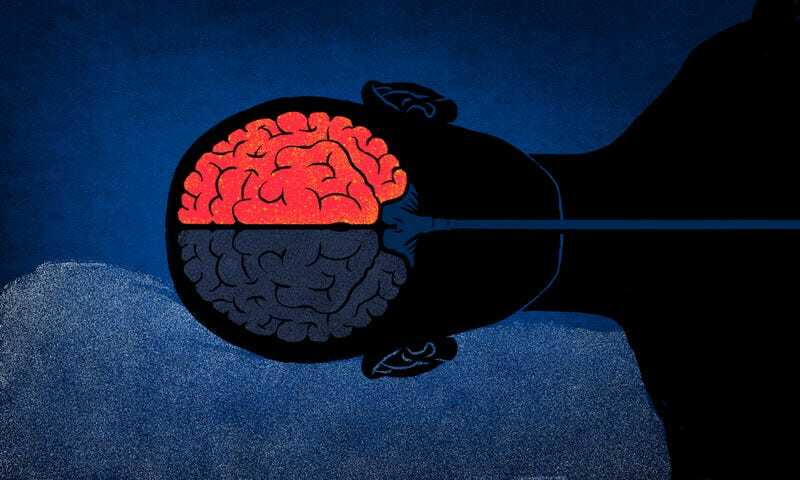 New research shows that one hemisphere of our brain stays more active during the first night of sleep—and it does so to keep us ready for trouble. It’s a phenomenon scientists refer to as the “first-night-effect.” A neuroimaging study by Brown University researchers reveals that, under these “first night” conditions, one hemisphere of the brain stays alert. “This half-asleep, half-awake state may work as a way to monitor unfamiliar surroundings,” study co-author Masako Tamaki told Gizmodo. The paper has just been published in Current Biology. Some marine mammals and birds exhibit a more pronounced form of this “unihemispheric” sleep. In dolphins and whales, one hemisphere shuts down during sleep while the other remains partially active. This allows the dolphins to sleep, and still surface to take a gulp of air. Birds do this on long migrations, so they can sleep and navigate at the same time. The human brain doesn’t display this dramatic degree of hemispheric asymmetry, but the new study suggests that our brains have a simplified version of this capability. Sleep scientists are all too familiar with the first-night-effect. When conducting sleep tests, they often disregard the data collected during the first night. They’ve even got a name for it: “adaptation night.” In an effort to better understand the neurological factors behind this sleep disturbance, the Brown researchers peered inside the brains of 35 volunteers. They found that, during the first night of sleep, a particular network in the left hemisphere remained more active than the right hemisphere, and this tended to occur during “slow-wave” sleep—the deepest stage of non-REM sleep. The hemisphere that experiences lighter sleep also showed greater sensitivity to sounds. When the researchers played irregular beeping sounds into the right ear (thereby stimulating the left hemisphere, and not vice-versa), this increased the chances of the participants waking up. What’s more, they awoke more quickly and were much more alert than if the sounds were played in the opposite ear. These observations make a lot of sense, particularly from an evolutionary perspective. The first-night-effect is very likely a vestigial trait that once protected our ancestors, and it’s something that has stuck with us ever since. The act of sleeping can be quite perilous (well, at least out there in the wild), but it’s critical for mental and physiological health. Sleep allows the brain to consolidate memories, and it helps with nervous system function. The first-night-effect may be something we have to live with, but the researchers say there are ways to counter it. “You can bring something that makes you feel comfortable with a new place, like your pillow,” Tamaki said. And try not to worry too much, since worrying wakes the brain. “Also, it’s good to arrive in a place at least two nights before your important event so that you can have a good sleep the night before,” he added. Moving forward, the researchers would like to know if the default-mode is the only night watchman, and if other parts of the brain remain on alert. They’d also like to know why the left hemisphere plays such an active role in the process, and if the left and right hemispheres alternate during sleep.